When it comes for promotion of business using Fan page in Facebook, lot of points and tricks have to be applied for doing so. The promotion of the Facebook business page depends on most effective and important formats which are Photo contests, Video contests, surveys, sweepstakes, etc. Introduction of "Photo Contest" app was done in 2012 with the release of yet another similar app called "Video Contests". 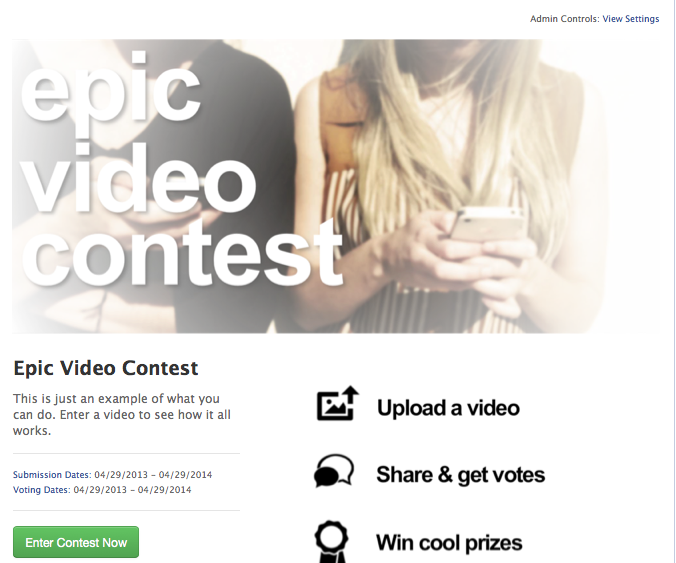 What actually is "Video Contest" in Facebook? The fan page admins who have business pages want to engage their fans with some attractive offers and an opportunity to participate with brands on Facebook. Video contests can be created with an app. As "Videos" go viral, tricky way to promote any business page is to create a "Video Contest" for your fans and attract new fans. "Video Marketing" is termed as the best way to promote your brand or business with correct arrangement of keywords, content and attractive offers for your visitors. Why to create "Video Contests" in Facebook ? As stated above, videos go viral and termed as the best way to promote the business or brands. Think of an advertisement without their videos. Will you buy any product with the name and brand of the product just by seeing the label on it? Maybe the trust factor will be missing. That will be gained with the use of videos which will inform about the features of the product or brand. In the similar manner, your brand needs exposure to more customers and to gain the trust of them the videos should be created. But the video contest factor or promotion technique will not only gain more visitors for your fan page but also engage them in the contest to win the "Special offers" decided by you. Taking these points into consideration, lets get started for creating a successful "Video Contest" in Facebook.